Ok, first of all, why haven’t I been to Prague before? And how come no one ever mentioned to me how beautiful this European city was? As someone who loves travelling, why do I know so little about Prague? In fact the only thing I have heard about Prague is that it is a hotspot for stag dos and cheap beer. Cheap beer of course naturally attracts young British tourists. As someone who is not a huge beer fan, this was hardly a selling point and would rather sit in front of the lake in Geneva watching people go about their business. But here I was in the middle of the old town in Prague on a Friday evening with a look of bewilderment and surprise. Surprised at what my eyes were seeing. Just in case I haven’t already said it, Prague is incredibly beautiful. The fact that I was blown away by its beauty is probably down to me having little expectations. If anything, I had this notion that the city is overrun by old Gothic looking buildings and architecture with beer houses dotted all over the place. In fact I know so little about Prague or the Czech Republic in general that I only found out their currency is Koruna when I was on my way to Heathrow airport to catch my flight. I mean seriously what on earth was I thinking? All along I assumed it was the euro. Waiting for my flight at the airport with little to look forward to, I began to plan how I could explore the fashion scene in Prague, which based on a link a friend sent me, hardly exist. Knowing at least that Prague is not a city associated with fashion and trends; I was determined to discover up and coming Czech brands that I could blog about. I mean there has to be more to Prague than stag dos and cheap beer and if I should spend my time exploring anything, then it has to be fashion. Well that was the plan at least. The reality of what I ended up exploring couldn’t have been any more different to what I had in mind. The architecture! All of it and I mean Romanesque, renaissance, gothic, functionalist, cubist, classicism, historicism, post 1989 and by far my two favourites, Baroque and Rococo. The architectural styles span several centuries and makes the city looks like it wears it history on it sleeve. 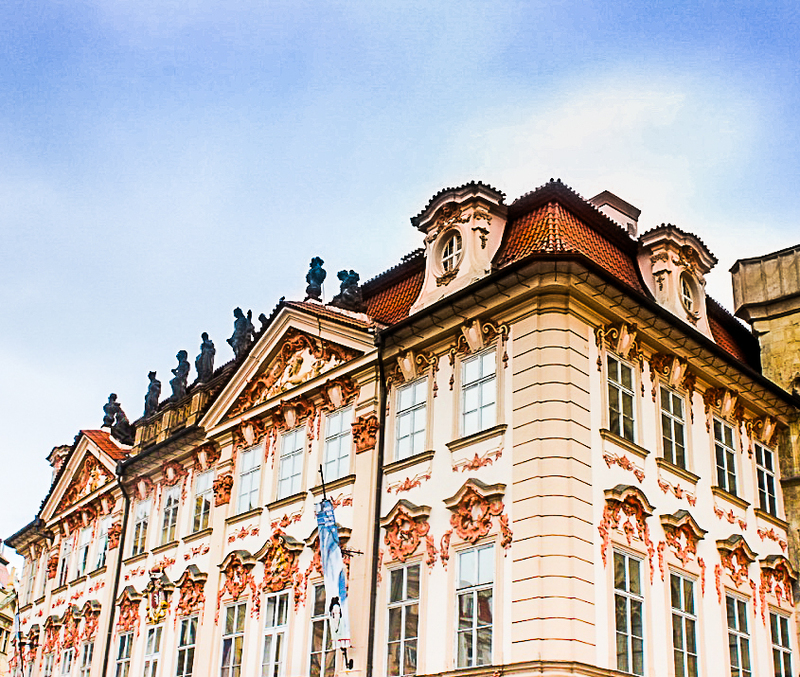 If architectural diversity and taste were fashion, Prague would have been the capital of Europe ahead of London, Milan and Paris. Anyway, enough typing for now as I would rather the photos speak for themselves. I hope they do justice to this wonderful city. I will do another blog post about Prague in the near future to share more photos. When a good friend Cano told me about the exhibition and launch of a book called Return of the Rudeboy, curated by Dean Chalkley and Harris Elliott, I immediately sprang into action by first entering the dates into my diary, and then proceeded to doing a bit of online research on the origins of the concept. I was quite keen to check out the exhibits this time round as I missed their very first London exhibition at somerset house in 2014. I have heard and seen Dean and Harris’s body of works before and even follow their Instagram page but did not really know much about the history of Rudeboy and wanted to have a deeper understanding of its roots. What better way to do so than speaking to the two men who made it all possible, so off I went to the hospital club in Covent Garden. ‘Rudeboy’, no I am not referring to Rihanna’s 2010 hit song. Just in case this is your first time hearing about “Rudeboy” in this context let me try to give you a quick background to it Jamaican origins from the 1960s to its present day use here in England. What is a Rudeboy and how is the style relevant today? Rudeboy is said to be the first youth subculture of Jamaica after the country gained independence from Britain in the 60s. This subculture was necessitated by poor living conditions in the shanty towns of West Kingston were an underground economy grew and young people had to find ways to survive by any means necessary. The youth quickly became disenfranchised and violence ensued, even leading to curfews being put into place to curb such violence. With these struggles by marginalised citizens came the need to form informal and sometimes illegal groups and gangs to protect and fend for friends and families. The original Rudeboys was formed. The rudeboy wore sharp suit and pork pie hats to create their own personal style. Some say they did so to mimic the lifestyle of the upper class adding sunglasses to the look which they wore at all hours of the day. Living in the slums of West Kingston but wearing sharp suits and ties makes the rudeboy identifiable by their neighbours in the slums and suspicious to the upper class of Kingston. They literally stood out and with time, Ska music was associated with the Rudeboys. Looking back in history, it may seem like Ska music and the Rudeboy subculture have enjoyed a close relationship from the start. However, Ska music came before the Rudeboy image was recognised as a subculture in the mid to late 60s. Ska itself is a music genre with elements of mento, calypso, American Jazz and rhythm and blues and in the late 50s Jamaica and a predecessor of genres such as Rocksteady and Reggae. Apart from dressing well and being huge fans of Ska music, the Rudeboy subculture helped spread the music to the working class which later became known as 2 Tone Ska upon it revival in England in the 70s. Subsequently, Rudi and Rudies (Rudeboy and Rudegirl) became terms used to describe fans of 2 Tone Ska as they enjoyed a strong presence within the genre. British youths in the 70s, both black and white wore sharp suits, with slim ties, pork pie hats and shoes to match to identify with the movement’s Jamaican roots. As with its earlier days, the Rudeboy movement divided opinions and Ska artists of the 70s were no exceptions as some see the subculture as a menace whiles some celebrated it. Fast forward to present day “Return of the Rudeboy”, fashion photographer Dean Chalkley and creative director Harris Elliott curated various pieces of sharply dress individuals who show the essence and spirit of a Rudie through what turned out to be successful exhibitions both in London and in Tokyo. Speaking to Dean himself on the last day of the London, Covent Garden exhibition, it became apparent that all the Rudies photographed had their unique styles through which their individual personalities shown but collectively embodied the essence of the Rudeboy look. Dean made sure to point out that none of the photographed Rudies were styled by himself or Harris. As Harris Elliott himself put it, ‘Rudeboy image is not down to the clothes but the wearer of the clothes. The spirit and attitude the wearer channels through their personalities’. It is easy to see this as I admired the printed exhibits. The looks of a Rudeboy back in the 60s is a far cry from what we identify today as Rudeboy in the inner cities of London. Rudeboys or Rudegirls these days are more likely to be wearing sportswear showing their bottoms than a well-tailored suit. In fact the youth that refer to each other as ‘Rude’ today deliberately wear hoodies as a way of differentiating themselves from the suit and tie, which is seen as conforming to the status quo. The re-emergence of original Rudeboy dress code highlights how inner city subculture usually associated with disenfranchised youth has evolved over time. From the dance moves of the Ska music, to the way Rudies wear their hats and ties means that the Rudeboy movement is not limited to what you wear but the attitude and spirit the wearer gives off defines one as a Rudie. Just before leaving, I asked Dean when we should be expecting another exhibition. He simply smiled and said we shall see. So until then I recommend you get the book here.